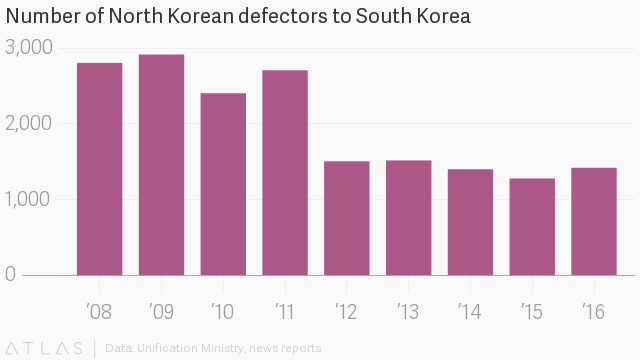 The number of defectors leaving North Korea dropped 12.7%, from 692 people in the first eight months of 2016 to 780 people in the same period in 2017. The number of defectors dropped from 2,000 to 3,000 per year between 2008 and 2011, to fewer than 2,000 per year over the past five years. There were about 1,420 defections in 2016. Fewer North Koreans are leaving the country in part because it has gotten harder to cross the border into China. Over the past few years, the governments on both sides added more fences, signs (informing defectors and smugglers of punishments), and personnel. There are other reasons, including the improvement of the North Korean economy, more anti-defection propaganda, and more paths to leave the country legally, as worker or traveler.